By Marika Kesler, 2nd year student, MPhil Textile Conservation. 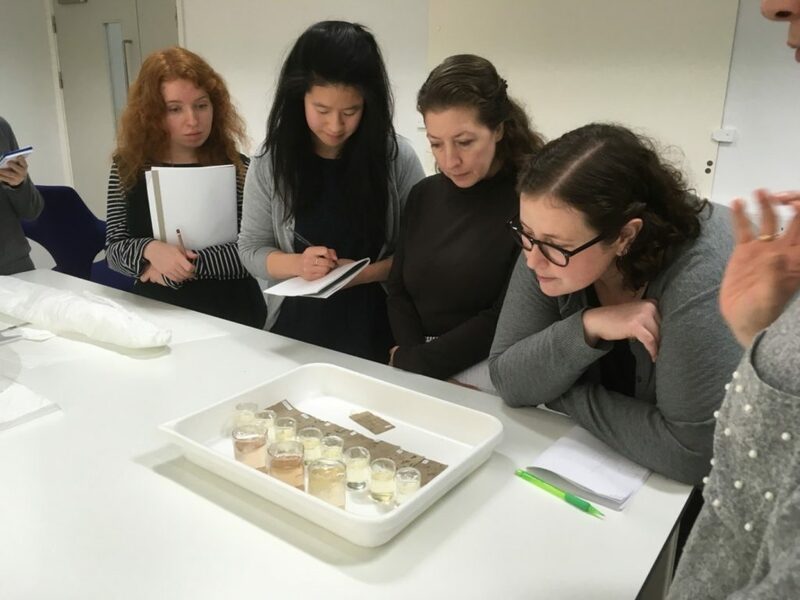 As described in an earlier post, the second year course Conservation in Practice aims to put the theory and practice of textile conservation into a professional context, placing practical treatments and the wide ranging work of conservators at different institutions into that context. While visiting lecturers to the CTC brought us into many institutions ‘virtually’, visits to see current projects in situ were a rare treat. 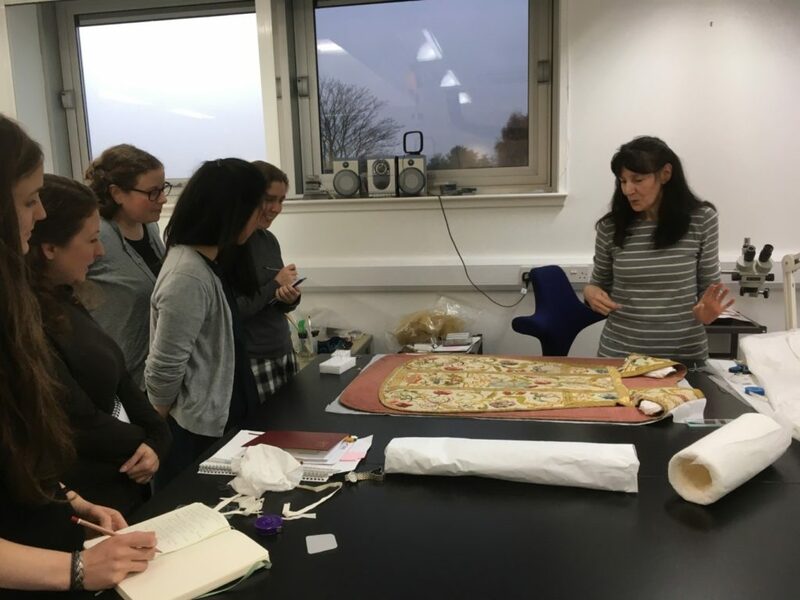 Lynn McClean, Principal Conservator, Paper & Textile Conservation at NMS met us at the National Museums Collection Centre at Granton in Edinburgh and introduced us to the facilities, the structure of the department, and the responsibilities of the staff. The analytical labs were the first stop on our tour, where Lynn handed us over to Dr Lore Troalen, Analytical Scientist in the Collection Science section. Lore gave us a short lecture on x-ray based analytical techniques and their best applications, such as the use of x-rays for determining internal structures of objects, and x-ray fluorescence (XRF) and Scanning Electron Microscopy (SEM) for identification and elemental analysis of inorganic materials (often applied for metal thread analysis). 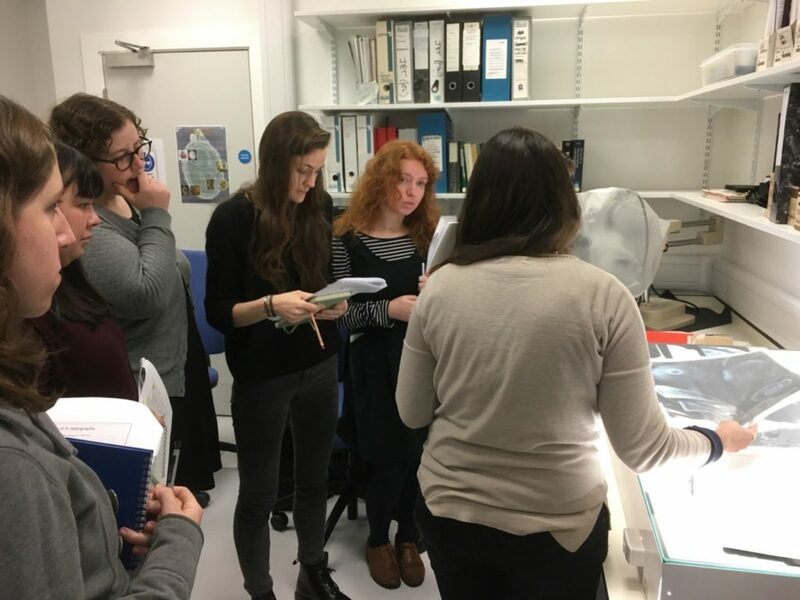 We even got a chance to learn how to interpret raw data from XRF by analysing the true silver content of one student’s silver hallmarked earring! Dr Troalen showing the group examples of x-ray images of treasure trove objects © University of Glasgow and with permission of National Museums of Scotland, 2018. 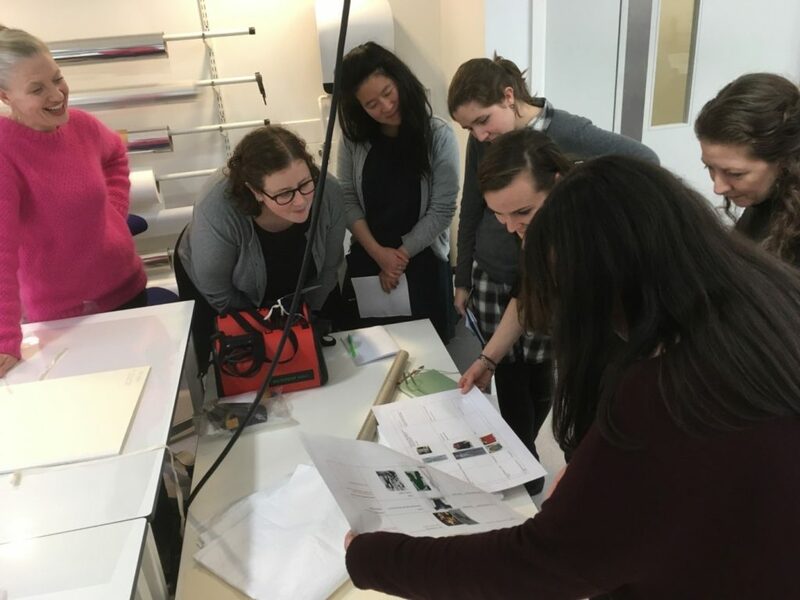 Next stop on our tour was the textile and paper conservation labs, where Lynn brought us up to speed on the planned updates to the studio facilities as well as the plans for display rotations. We were then introduced to the current projects of the textile conservation staff. First was a fascinating project in which Maria Armstrong, Assistant Textile Conservator, had applied a new technique to clean a fragile silk man’s Banyan. Maria shared her treatment process, starting with attending a workshop by Richard Wolbers, then applying the theory learnt on the workshop in order to ensure that the cleaning was as gentle as possible. It was encouraging and inspirational to us as students, to whom almost all techniques are quite new, to see conservators in the field learning and practicing new techniques to keep their knowledge and experience up-to-date. And in true collaborative style to keep us all informed, Maria has even written a fantastic post on NMS’s blog if you are interested in finding out more about this project. 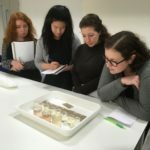 Our class studying Maria’s wash bath samples that clearly illustrate the success of the new technique © University of Glasgow and with permission of National Museums of Scotland, 2018. Maria talking us through the rest of the Banyan project, where she is currently working to support the weak and damaged silk lining © University of Glasgow and with permission of National Museums of Scotland, 2018. The other projects we saw were a delightful mix of techniques of longstanding application (all tailored to each object of course), as well as further new and innovative solutions. Textile Conservator Irene Kirkwood was supporting a beautiful embroidered chasuble with stitched patch supports; Assistant Textile Conservator Danielle Connolly was conserving a challenging many-layered House of Worth gown; and Textile Conservator Miriam McLeod was simultaneously working on 2 projects: the support and mounting of an Egyptian knitted wool sock, and a collaboration with Glasgow School of Art, Digital Design Studio (now the School of Simulation and Visualisation) to digitally reproduce designs for use as visual infills for display, in this instance specifically printing a fabric based on the design of a mantua in the collection that will be used to cover a reproduction stomacher for the costume. Stomachers are so often missing from these ornate gowns before their accession into museum collections, and using plain stomachers for display often seem to draw the eye with their starkness rather than enhance the costume. Irene Kirkwood introducing us to her chasuble project © University of Glasgow and with permission of National Museums of Scotland, 2018. Discussion with Miriam McLeod about all the planning and hard work that goes into the creation and execution of a display rotation plan. Our visit to NMS’s Collection Centre and their conservation labs was fascinating. It reinforced and illustrated the range of skills necessary for practicing conservators, who are not simply expected to carry out in-depth practical treatments on objects, but to be actively involved in their care and study on much broader levels too, from management and administration to education and outreach. 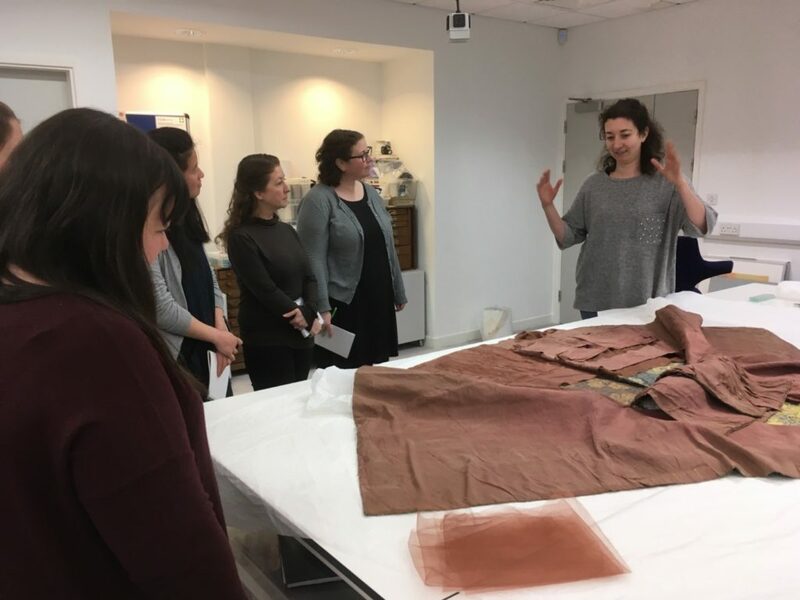 Another part of the professional responsibility taken on by conservators is to share knowledge and expertise and we are exceedingly grateful to the conservators we met at NMS for being so generous with their time and experiences. It is much appreciated by us as emerging professionals with much to learn. Thanks to everyone at NMS for a wonderful day, and to all our visiting lecturers for sharing their knowledge and expertise and for making the Conservation in Practice course so valuable.